As autumn leaves turn their brilliant hue join us for good conversation and delicious food! Thanksgiving will be here before you know it. 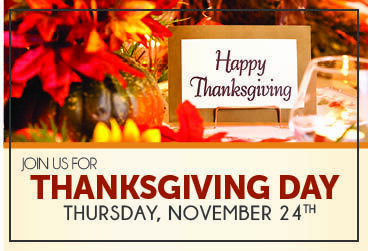 Enjoy our Thanksgiving Day Champagne Buffet with family and friends! - Fresh Pumpkin Pie and more! Plus, Holiday Drink Specials, Bloody Mary Bar and Kids Craft Station! *Menu subject to change. Regular dining room menu will not be available. Credit Card needed to secure reservation. Reservation cancellations must be made 24 hours in advance. Breakfast available until 3pm.